If you haven’t yet had a chance to listen to the Bruce Cassidy interview conducted this morning on 98.5’s Toucher & Rich Show, stop what you’re doing and devote your next 19 minutes to one of the more candid engagements in radio format that you’ll hear from an NHL coach, period. This is vintage Cassidy- in my dealings with him, he’s always taken extra time to go into the details of what makes a player successful or why he’s not performing to a level capable. Cassidy is a true student of the game and he won’t sugarcoat things. If someone plays well (he once went into an extended commentary about Brian Ferlin that timed out at more than 3 minutes- it’s a shame injuries- a concussion and major knee injury have derailed his development in Boston.) he says so. If someone isn’t holding up their end of things, or their play doesn’t warrant a key role in the lineup, he says so. And, he does it by giving the listener more details and a rationale that you don’t always get from bench bosses who will speak cryptically and in clichés more often than not. So, here I am with another post with my 3 Amigos colleagues Kirk Luedeke (the founder of TSP) and Reed Duthie. If you missed the previous posts, look back not too far and you will find them. I hope (I’m sure) you will find them informative. Decisions, decisions, decisions: That’s what is facing Bruins General Manager Don Sweeney, President Cam Neely and the brain trust of your Boston Bruins. The most critical decision dropped this week when the interim tag was removed from coach Bruce Cassidy. It was crucial for this to be done as early as possible because, despite being two months away from the expansion draft and the entry draft, some key decisions are going to have to be made by mid-June as to which players receive qualifying offers and contracts, and who moves on, potential buyouts and buried contracts. This is what we’ll focus on today. The Boston Bruins iced a largely untested lineup Thursday against a more experienced and closer-to-opening-night roster in Columbus versus the Blue Jackets, and the kids skated away with a 2-1 regulation victory. After carrying play for the first 40 minutes, the Baby B’s found themselves on their heels a bit- they did get goals from Matt Beleskey (1st period on a deflection of a Colin Miller point shot) and Seth Griffith (on a beautiful sauce pass from Jake DeBrusk) to make it 2-0 Boston in the third. When Brandon Saad beat the D with his speed and Malcolm Subban with a bullet shot to make it 2-1, the home team put on a furious surge, but Subban proved up to the task and stopped everything else that came his way including a last-second Zach Werenski would-be equalizer. After the game, Boston head coach Claude Julien was effusive in his praise of multiple young players, with most of his positive waves going to defenseman Brandon Carlo and DeBrusk. We’re less than a week from the start of the 2016-17 regular season, and you have to think that Julien was encouraged by what he saw last night on the road. Sure- veterans with bigger-ticket contracts will still likely benefit from the economic reality and make the team ahead of young, lower-cost guys who can go down to Providence without being exposed on waivers, but one of the more important purposes of these exhibition games is to give the coaches a sense of who they would want in the lineup should a veteran get injured, underperform or find himself headed out of Boston in a trade or transaction. The B’s win over Columbus likely earned some respect, even if it may not have been enough to solidify NHL roster spots for a few of the standouts. Even though many observers tend to seek an egalitarian viewpoint when it comes to deciding who makes it and who goes down, not to mention a natural, shall we call it- an “implicit bias” to want to see shiny new toys up with the NHL club, the league’s salary cap system often makes that a tough balancing act. It is easy to blame coaches like Julien for wanting to ice “binkies” (read: safe, experienced but low-upside veterans)- in lieu of accepting risk with younger, more skilled guys who are also more prone to making mistakes and potentially costing the team points. The truth is- it isn’t that simple, and management/ownership gets a vote, too. Right or wrong- it doesn’t make sense to spend millions of dollars on one-way contracts in the minors and while you can criticize the wisdom of signing players like Riley Nash and Dominic Moore, there is no shortage of fans and media types who would have blasted the team for putting too much stock in young, untested players. NHL teams have always hedged against putting too much trust in the youth movement, it’s just that the modern era of cost certainty makes some of those moves look bad in hindsight. At the same time, just because a rookie plays well in the preseason does not mean he’s ready for primetime (Cameron Mann, anyone?). And so- it does become a balancing act in terms of deciding whether the value lies in having a young player with the NHL team in a smaller role but benefiting from being at the highest level and immersed in that big league culture on and off the ice, or whether he’s better off playing more minutes in expanded situations in the AHL. Because entry-level contracts are two-way deals, it makes more economic sense in many instances for management and coaches to send the player down for more seasoning at the ‘AAA’ equivalent level. Having said that, here are many of the Boston rookies (or at least those still with the team as of today) and where we think they stand as the team will make its final cuts in the coming days and ice a lineup next week that will undoubtedly look different from the one that will take the ice in Game 82. Whether the B’s will be looking forward to the postseason at that point or we’re headed back to the drawing board for another disappointing offseason is the great hockey adventure that will unfold over the next six months. Noel Acciari, C- This versatile forward played 19 NHL games with the B’s to close out 2015-16 and is already a trusted agent with the coaching staff. His challenge is to make the opening night roster with the additions of other similar, but more experienced NHLers having been brought in during the summer months. We think he can do it, but going back down to Providence for a spell might help refine this more defensive, grinding center’s offensive skills. He hits hard, but clean and has been a revelation after being one of multiple free agent signings in the spring of 2015. Brandon Carlo, D- The B’s are lean on right-shooting defenders, so while the soon-to-be 20-year-old is pretty green and raw yet, with his size, reach and mobility- he just might have done enough to grab a roster spot out of the gate. Even if the 2015 second-rounder (acquired with the first of two draft picks for Johnny Boychuk) doesn’t earn his way into the top-six defensive rotation on opening night, we expect that he’s close and should get an opportunity to see playing time when inevitable injuries or other situations occur. He shouldn’t be seen as a dominant two-way D/savior kind of player, but he’s still developing and could eventually become a solid NHL No. 3 who already has advanced shutdown type potential. Austin Czarnik, F- What else can we say about the little buzzsaw who keeps opening eyes around the organization? Czarnik might be just 5-9 (barely…and that’s in skates), but he’s a speed demon who has the creativity and puck skills to be an offensive threat while is smart and defensively aware enough to thrive in Julien’s system. The biggest question with Czarnik is whether he’ll make it as a center or be employed at wing, where he’s been practicing, but the Bruins love versatile guys who can play anywhere. He was called up late last season but didn’t make his NHL debut. This year, he’s going to get into the historical ledger at some point, even if his role is yet to be determined. Danton Heinen, F- The first-year pro has been a nom du jour in Boston hockey circles for a while now, as he put up two very good NCAA seasons with Denver University before signing last April. He’s not flashy or dynamic the way Czarnik is…Heinen doesn’t have the seek-and-destroy (without headhunting) mentality of Acciari or Beleskey, either…but he’s fast enough to make plays at both ends and strong enough to excel in the wall work and net-front power needed for the modern NHL. Just when you start to say to yourself “what does this guy do?” he’ll make a sweet dish or bury a quick strike to the back of the net. Julien loves guys like Heinen, and the organization has been highly impressed with Heinen’s mature and refined game for some time now. With Frank Vatrano in recovery from foot surgery, opportunities are there for players like Heinen to take advantage of. Jake DeBrusk, LW- It’s no secret that we’ve been bullish on DeBrusk since before the 2015 draft and perhaps Bruins fans are starting to see flashes of why after he suffered through an agonizing injury last year that left stat watchers ignorantly ranting about him on Twitter and the Internets. Part of why DeBrusk has caught flack in some circles of Boston fandom is something completely foolish that he can’t control- the old covetous attitude of wanting different players taken at the 14th spot instead of him. That’s life and sports- and to be honest- there is an honest argument to be made for several guys whom Boston could have had, but didn’t, Unfortunately, that kind of what-if stuff is counter productive, so have it, but you won’t see it here at TSP. Instead- DeBrusk continues to show off a high-end creativity and offensive skill that saw him net 41 goals in his draft year. Last night’s pass to Griffith for the game-winner was subtle and perfect- he protected the puck from the defender who was hooking and obstructing him to no avail. DeBrusk pulled away and then put it in the one spot his teammate could get to it and fire the shot home. That was a hockey player’s move and DeBrusk is a hockey player. He’s got some rounding out to do in his game and should get a chance to do that in the AHL rather than being forced into the NHL’s bright lights right away. Sean Kuraly, F- Czarnik’s Miami University (the Brotherhood!) teammate was acquired on June 30, 2015 in the deal that sent Martin Jones to San Jose. He’s a big guy who can skate quite well for his size and has underrated hands, but probably lacks the higher-end vision and hockey IQ to be a top-six NHL forward. Having said that, the Ohio native brings the kind of traits to the table that the Bruins value: he’s heavy on the puck, willing to grind and take hits needed to gain and maintain puck possession and will go to the greasy areas of the ice. He’s been impressive after a pretty lackluster senior year scoring-wise in which more was expected, but a member of the Bruins organization told TSP back when the team acquired him that they envisioned him as a 3rd or 4th-line checking winger, so in that regard- Kuraly is on target. Because he can go down to Providence without being put on waivers, he’ll likely need that chance to play and develop rather than be a spare part in Boston, but he could get a shot at the big time at some point. Rob O’Gara, D- We agonized over putting the 23-year-old Yale product in the locks section, but in the end- the belief here is that he’s more valuable in the AHL soaking up big minutes in all situations and developing under Kevin Dean rather than sitting in the press box in Boston. Barring a rash of injuries, O’Gara needs to be playing a lot at this stage and he’ll get that chance in Providence moreso than if he slots into Boston, where the left side is pretty well established between Torey Krug, Zdeno Chara, John-Michael Liles and even Christian Ehrhoff, who is in on a tryout but is a left-shooting D. O’Gara’s going to be a good one- he’s shown that time and time again in college, his brief AHL look last spring and in a few impressive spots here in the preseason. But, we don’t think his NHL time is quite now. Malcolm Subban, G- Give him some credit- the first-round pick in 2012 showed some poise and moxie against Columbus in preserving the win he was handed when he came into the game after Anton Khudobin. Tuukka Rask and Khudobin are Boston’s 1-2 goalies this year, but Subban is showing the coaches that he’s got the stuff to come up and be a backup goalie if someone should get hurt. He’s such an athlete…but that’s also been the knock on him, as he tends to overcompensate for flaws in his technique through his athleticism. As he continues to gain experience and get better in dealing with in-game situations, Subban is looking more and more like he could one day start to fulfill the potential Boston saw enough of in him to grab him where they did. But, he’s also hit setbacks in each and every year of his pro hockey career, so this is huge season for him to stay healthy and be ready to go if Boston needs him. Brian Ferlin, RW- He’s a good guy and you feel for him given the concussion he suffered in April 2015 and its lingering effects. Unfortunately, Ferlin brings a certain lower-line appeal in a sea of players who have the same style and relatively low ceiling. He’s a big-bodied winger who has some untapped offensive tools (he was Kuraly’s USHL teammate with the Indiana Ice), but needs more time to work that out in the AHL- the B’s can’t really afford to keep him around based on the talent and experience levels of others fighting for the same position on the team. Seth Griffith, RW- He’s technically not a rookie, but he’s still in the mix and last night backed up what he’s been good at (at least in the AHL)- finding the back of the net. We still can’t help but think he’s a ‘tweener, but he does have sweet hands and a good offensive mind. Ultimately, he’d have to be put on waivers to be sent down to the AHL, so that could mean the Bruins will keep him at the expense of someone else who doesn’t have to clear. Or- he could be included in some kind of trade package going forward. Either way, Griffith is still scrapping for a job and that’s a credit to him after he got injured a year ago and lost his shot at the NHL. He’s a superb player for Providence, but the jury is still very much out as to whether that excellence can translate to the highest level. Defenseman Rob O’Gara, who was drafted one round after Ferlin, has taken a longer, more gradual developmental path to pro hockey, but is finally beginning his first full season after completing a four-year degree at Yale University. The 23-year-old (he celebrated his birthday last week), who spent another year in prep hockey with the Milton Academy Mustangs after the Bruins made him the final selection of the fifth round (151st overall) five years ago, won a NCAA title as a freshman and earned ECAC defensive defenseman of the year as a junior. Although he has just five pro hockey games under his belt (he did score his 1st pro goal in the process) with a late-season appearance in the AHL with Providence, O’Gara is a dark horse candidate to see playing time in Boston at some point this season if everything breaks right for him. This post will peel back the onion so to speak on one of Boston’s more unheralded prospects- a guy who has been as consistent and effective a player since bursting onto the prep hockey scene six years ago and forcing NHL teams to take notice of him en route to Milton’s 2011 championship. O’Gara isn’t flashy, but with his size, skating and potential, he could be a solid contributor to the organization’s fortunes sooner rather than later. O’Gara was an unknown commodity when he left his home in Nesconset and the Long Island Royals 16U minor hockey program for Massachusetts and prep school at Milton Academy. At about 6-3 at the time (and very thin/lanky), he caught the eye of scouts immediately because he moved pretty well and didn’t show a lot of that gangly awkwardness that is so prevalent with players at that size/age. What also stood out was the contrast O’Gara provided to his Milton defense partner Pat McNally, another New York guy who had been drafted in 2010 by the Vancouver Canucks (now with the San Jose Sharks organization). McNally was an attacking, push-the-pace and often get caught up the ice defender, so O’Gara stood out for his more measured style and for the fact that McNally’s gambles at times meant that his partner was back to defend odd-man rushes on his own. O’Gara showed off a natural poise and smarts right away to go with an active stick- he landed on NHL radars and was identified as one of the top New York talents available in the 2011 draft. O’Gara reached his zenith in March, when in the championship game against a Kent Lions team that featured current Boston Bruin Noel Acciari (the captain) along with 2012 NHL second-rounder Cristoval “Boo” Nieves, he made a critical play along the blue line to keep the puck inside the offensive zone during a 2-2 game late in regulation. He then made an on-target pass to teammate Sean Okita, who buried the puck for the winning goal. O’Gara only had seven assists (along with two goals) that year, but one of those helpers was as big as it gets, which gets to the heart of where his big league potential might truly lie: he’s always been big time in the clutch (more on that later). Although not invited to the NHL’s annual draft combine because he was not ranked inside the top-50 among North American skaters, O’Gara interviewed with at least five NHL clubs during the spring and more clubs expressed interest before the draft. He and his family opted to stay home rather than travel to Minneapolis/St. Paul and he followed the selections along with his father, Brian (and mom Christine). Although the family grew up staunch NY Islanders fans and supporters, that all changed when the Bruins called Rob’s name at the end of the fifth round. Turned 18 just yesterday and his skating really came to the fore today. He’s tall, but a stringbean. But, have to keep going back to the fluid stride and quick, agile footwork. Had he spent two years at Milton Academy before the draft instead of just the one, I’m convinced that he would have been as high as a third-round pick, but solid at least a solid fourth-rounder. I don’t think enough NHL teams knew about this kid going in, but Boston did because he plays in their backyard. Long-term project, but O’Gara could be a steal. Size + mobility + intelligence + character almost always = player. He returned to Milton for his senior season in 2011-12, wearing the captain’s ‘C’ and while the team did not enjoy the success of the previous year with so many veteran departures, O’Gara produced at nearly a point per game pace (25 in 24 games after 9 in 29 as a junior) and was widely recognized as the top defenseman in prep hockey that season, earning All-New England recognition. With that, he completed his prep career and moved on to the next challenge in New Haven, Conn. with Yale. O’Gara wasted little time demonstrating to head coach Keith Allain and ECAC hockey watchers that he was a worthy NHL prospect, quickly establishing himself in a lineup that would go on to win it all in the span of about five months once the 2012-13 campaign got underway. As was the case in prep, O’Gara was relied upon to be a defense-first, stay-at-home guy as a freshman with the Elis, and he carried it off well, despite not finding the back of the net at all- posting seven assists in 37 games. Never one to dwell on the numbers, the real pride O’Gara had was in showing off the kind of ability and poise to earn a regular shift in Allain’s rotation throughout the year. His team allowed just two total goals in its two-game Frozen Four appearance that year in capturing Yale’s first (and only) NCAA title. In Yale’s 4-0 championship game over Quinnipiac University, as the clock ticked down to zero, O’Gara was on the ice playing a tenacious defense and making sure that he did his part to preserve the shutout. “I’ll sit alone at home and I’ll see the watch we were given for winning on my desk, and I still can’t believe it. It’s just an incredible feeling,” O’Gara told veteran reporter Mike Loftus of the Patriot-Ledger at the 2013 Bruins development camp, a few months after winning it all. In 2013-14, O’Gara earned the team’s John Poinier Award as Yale’s top defender. He also earned Second All-Ivy and ECAC All-Academic honors. In 2014-15, he was named the ECAC’s top defensive defenseman, which is impressive because he also posted his career-best in offense with six goals and 21 points, leading the Yale blue line in scoring. He was First Team ACA/CCM All-American (East), First-Team All-ECAC and First-Team All-Ivy among several other distinctions to include another Poinier Award as team defensive MVP. 2015-16 was disappointing statistically compared to his breakout in 2015, but O’Gara finished his college career strong, nominated for the Hobey Baker Award as college hockey’s top player, named a semifinalist for the Walter Brown Award (New England’s top college player) and a second consecutive All-Ivy League First Team selection. TSP featured O’Gara last October, as he prepared to embark on his senior year. For those who missed it, you can read it here. A season of ups and downs (including a two-game suspension in February after he retaliated with a slash against Harvard’s Sean Malone, who drove him into the boards) was overall a positive growth experience for O’Gara, who continued to add muscle mass to his big frame and got an enormous amount of playing time, as chronicled in this piece worth reading by Chip Malafronte in the New Haven Register. “He really epitomizes what we want our hockey players to be,” said Yale coach Keith Allain, who also worked in the NHL for 15 years as an assistant coach, goalie coach and scout. O’Gara joined the Providence Bruins late in the season, commuting between Rhode Island and Connecticut so that he could complete his course work and graduate with the degree in Economics he worked four years to achieve. Scoring his first professional goal for the P-Bruins was an added thrill for a player who won’t likely be known for his contributions on the offensive side of the ledger, but who is built for the modern NHL with his sturdy 6-foot-4, 220-pound frame- the body sculpting having taken quite some time to build. With nine defensemen in Wilmington this week, O’Gara is not required to join in the development camp fun, having benefited enough (in the team’s eyes) from his 2011-15 experiences. With his first full NHL training camp ahead in September, O’Gara will keep working out to prepare for that new challenge. If you’re into flashy, “upside” players then O’Gara won’t be at the top of the list, but when it comes to the big-bodied, mobile and smart defenders that have become critical components to winning in the modern NHL, Boston’s investment over time appears to be inching closer to paying off. He’s always been a smooth skater for his size- able to stay contain speed and prevent forwards from getting around him wide. While not an intimidating hitter and snarly type, O’Gara uses his body effectively and has made substantial gains in strength and quickness in the five years since the B’s chose him. With his long reach and positional savvy, he’s difficult to beat 1-on-1, but probably doesn’t get enough respect for his ability to skate with his head up and advance the puck quickly with a crisp outlet. This is not to say that he’ll be a classic two-way threat on defense, but he has enough in the feet, hands and head department that he can chip in with timely offense when needed. The guy is a winner- he always has been- and there is a great deal to be said for that. He made a critical play that resulted in a high school-level championship and then was put out in the final minute of a collegiate title as a freshman (full disclosure- his team was up by four goals)- that tells you all you need to know about what kind of performer O’Gara is when the game is on the line. Why O’Gara will play in the NHL this season: You can’t teach his size or physical attributes, and his steady development means that he’s mentally and physically ready to come in and play a lower pairing role right away (or in a pinch if the team is hit with injuries). He’s a likable guy who can walk into any room and fit right in because he’s always had the people skills and carried with him a measure of respect- he’ll sit down and listen/process everything around him and isn’t one to spend a lot of talking. When it comes to doing his job, O’Gara is the consummate quiet professional who gets after it without fanfare and is just as happy being a cog in the bigger machine- he doesn’t have a thirst for attention. Why O’Gara won’t play in the NHL this season: Right now, the B’s have some pretty well-established veteran players on the blue-line who like O’Gara, are left-shooting players. There is no need to rush him to the big show when he can take another year to play prime minutes in the AHL in just about every situation and shoot for making the Boston lineup when he has more pro experience under his belt. Whether he plays NHL minutes this season or doesn’t is not the question, but rather- that he continues to move forward and progress in his developmental trajectory. There will be ups and downs at the pro level, like many young players there are times when he will get caught puck watching or won’t make the physical play on defense when it is there for him. If you watch enough hockey, no matter how accomplished, every defenseman will be part of a goal scored against, it’s just a matter of learning from mistakes and not repeating them. When it comes to Rob O’Gara, the promise he showed as a mature and capable prep school defender more than a half decade ago is coming sharply into focus. Dougie Hamilton, who was taken 142 spots earlier than O’Gara was, is a Boston footnote who now plays in Calgary. As we all know from the old tortoise and hare parable, the race is not always to the swift…it appears that Boston will benefit from the faith and patience they showed in this player. Because of his playing style, O’Gara has never really occupied space near the top of the various Boston prospect lists nor has he been at the tip of everyone’s tongue when it comes to projecting who will meet or exceed expectations, but there aren’t many who have performed with more consistency or promise. He’s on the verge of achieving that goal that others selected well before him have not yet come close to. Don’t call him a tortoise, but he’s been steady as she goes all along. Dom, Reed and I are back with our 3rd podcast together, recapping the 1st week of NHL free agency with a decided Boston bent, covering David Backes, Anton Khudobin, Riley Nash, Tim Schaller and Alex Grant to name a few. Dom will tell you why he thinks Khudobin for two years, beyond the solid addition of a proven backup, has key implications for Malcolm Subban not getting snapped up in the expansion draft. We also issue a Danger, Will Robinson! alert to fans of the Edmonton Oilers as we look at the impacts of recent signing and additions to that club’s cap picture and we see some eerie parallels to how it all came unraveled in Boston. We also discuss (about 55 minutes in) the Bruins and Don Sweeney’s still pending move to upgrade the NHL talent on defense- that kind of a move to shore up the club’s right-shooting depth chart has been curiously lacking. Dom mentions an interesting name with Ontario connections and Reed has had plenty of looks and shares his thoughts on why this particular player (an RFA) might be a stealth target of the Bruins via trade. All in all, it’s a little over 90 minutes of hockey talk, unvarnished and calling it like we see it. Ole! 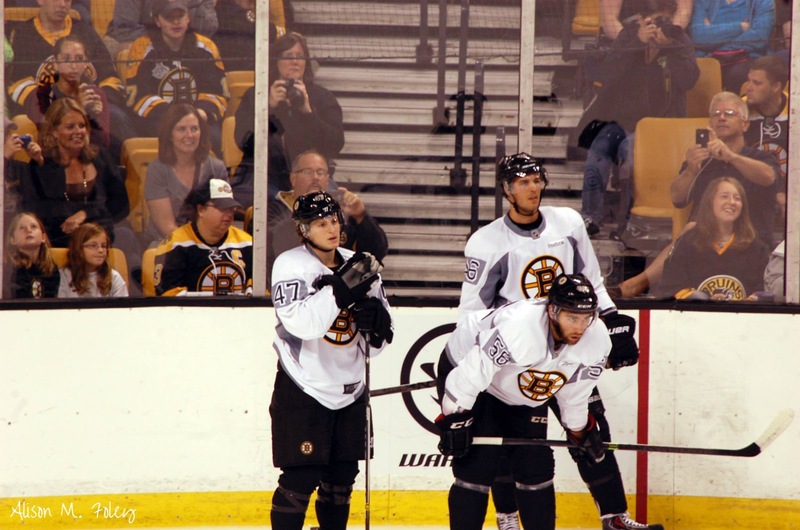 Most of the Boston Bruins’ are in offseason mode. Note, I said most- not all. Jake DeBrusk’s Red Deer Rebels were eliminated from WHL championship play by the Brandon Wheat Kings, but by virtue of being the Memorial Cup host city, they’ll be playing May hockey once the three CHL champions are decided. Jeremy Lauzon, who dodged a major scare after taking a skate blade to the neck a few weeks back missed Rouyn-Noranda’s third-round playoff series win over the Moncton Wildcats. He may or may not be back for the President’s Cup series against the Shawinigan Cataractes. The deeper the Huskies go, the better the chance that the B’s may see one of their three second-round picks back in action, but that will depend on medical clearance and the player’s long-term health takes precedence over the desire to have him in the lineup today. For everyone else, it’s about preparing for the 2016-17 season. I’m breaking up the prospects list into pro and amateur sections, and sliding all of the recent NCAA signings and players who are projected to be playing in the AHL season next year onto the pro side. Noel Acciari, C (undrafted free agent- 2015): The former Providence College captain finished the season with the big club, playing 19 NHL games down the stretch and impressing with his skating, smarts and effort. The single assist with the B’s is an indicator that offense will not be Acciai’s strong suit, but given more time to center the bottom line as he gains experience, more production will come. He’s an overachiever who is strong on draws, hits everything forcefully but cleanly, and immediately earned the respect and trust of coaches. He broke his jaw when he took a Chris Casto shot to the face earlier to the season or else, as reported by Providence Journal veteran reporter Mark Divver, Acciari would have made his Boston debut even earlier. He’s signed through next season (pending RFA) at a $792.5k cap hit. Linus Arnesson, D (2013 draft, 2nd round): The Swedish defender had tougher first full North American season than projected, dealing with nagging injuries for most of the year. Never a player who was thought of as having a high offensive ceiling, he’s mobile and savvy, but more was expected of him. With a year under his belt, Arnesson is a player who could see a Boston opportunity via recall at some point next season if there are injury issues on the B’s blue line, but if he can stay healthy, the focus will be on continued development. Arnesson is under contract through 2017 (pending RFA) at a $817.5k hit. Anton Blidh, LW (2013 draft, 6th round): Gritty, abrasive forward doesn’t bring much in the way of points potential, but if you’re looking for a grinding energy winger who forces turnovers and plays a heavy game, Blidh’s your guy. Having said that, the B’s have no shortage of forwards who fit in this category, so there’s not a big buzz factor here. He’s got two more years on his ELC (2018) with about a $784k cap hit. Brandon Carlo, D (2015 draft, 2nd round): One of Boston’s more eagerly anticipated prospects after being the 37th selection in June 2015, the late ’96-born Colorado native is eligible to spend the 2016-17 season in the AHL if he doesn’t make the Boston roster out of camp. At 6-foot-5, he’s highly mobile and a premium shutdown type defender. The jury is still out on his offensive instincts/vision to develop into a higher-end two-way threat at the NHL level, but make no mistake- this guy will play. Last fall, Carlo signed a three-year ELC that will keep him under contract through the 2019 season (RFA) at a rate of $820k per. Chris Casto, D (undrafted free agent- 2013): Casto posted his best pro season to date, but has the look of a journeyman pro at the AHL level and it’s hard to see him beating out those higher on the depth chart to make a go of it His ELC is up and there’s a good chance that the B’s will allow the former University of Minnesota-Duluth star to hook on with another team. Colby Cave, C (undrafted free agent- 2015): After signing with the Bruins a year ago, Cave showed some promise in Providence as an effective two-way forward with speed. He’s not a top-six project, but could in time establish himself on the lower lines. With two more seasons left (2018) on his ELC before Cave becomes a RFA ($655k), the former WHL captain is in the fold at a nice rate. Austin Czarnik, C (undrafted free agent- 2015): The AHL’s leading rookie scorer with 61 points had opened eyes this season. Despite his small stature, he’s a plus-skater with superb puck skills and the hockey IQ to provide offense. He nearly willed Providence to a victory in Game 3 of their sweep at the hands of Wilkes-Barre/Scranton, and is a solid bet to see NHL time with the Bruins next season. He’s signed through 2017 at a rate of $817,500 (RFA). Brian Ferlin, RW (2011 draft, 4th round): He was greatly impacted with concussion woes this season, his second pro campaign after a promising 2014-15 year that saw him earn a late stint in Boston. A bottom-six winger who can skate and excel in puck possession, Ferlin needs a bounce-back campaign in 2016-17. His ELC ($875k) is up and he is a restricted free agent. Seth Griffith, RW (2012 draft, 5th round): Providence’s top scorer (23 goals, 77 points in 57 games) saw some very limited time in Boston this season and is still on the bubble in terms of proving whether he can break into a top-six forward role or might be a ‘tweener as someone who puts up points in the AHL, but has trouble establishing himself in the NHL. He’s got the hands and head to score, but the lack of size and speed make it a challenge for him. Griffith’s ELC ($759k) is finished and he’ll likely be tendered a qualifying offer, but whether the B’s dangle him as part of a trade package at some point remains to be seen. Matt Grzelcyk, D (2012 draft, 3rd round): The Boston University captain signed a two-year (thru 2018) NHL contract worth a reported $858,750 per season (RFA) at the conclusion of his NCAA season. It was a tougher year for the Townie, as he dealt with starting the season late after knee surgery, only to injure his other knee shortly after coming back. His excellent speed and puck-moving ability will make him one of Providence’s top threats in all situations if he doesn’t win an NHL job out of camp next fall. Danton Heinen, RW/LW (2014 draft, 4th round): After a tough start offensively, the British Columbia native erupted in the second half of the year for Denver University, finishing as the team’s top scorer and helping DU reach the Frozen Four. He’s a slick, playmaking wing who posted a pair of assists in his pro hockey debut with Providence and is a darkhorse to break camp with the NHL Bruins on the opening night roster come October. He’s signed through 2019 at a $872.5k cap hit. Justin Hickman, LW (undrafted free agent- 2015): The Seattle Thunderbirds captain did not have the anticipated impact after missing the rest of 2015 to shoulder surgery and signing with Boston. He’s a hard-nosed winger with underrated scoring ability, but took a while to adjust and adapt to the demands of the AHL. Heavy on the puck and willing to play a physical, grinding game- watch for him to take on more of a consistent role next season, with about 15-20 goals at the AHL level a reasonable target to aim for. Hickman is on an ELC that keeps him a Bruin through 2018 at an (unconfirmed per General Fanager) $700k hit. Alexander Khokhlachev, C (2011 draft, 2nd round): Despite making a difference in the AHL for much of the season, the 40th overall selection was not able to do much with the limited ice time he was given in Boston. There’s not much else can be said that hasn’t been already at TSP- he’s talented enough to be an NHL forward but hasn’t translated being an impact performer on the farm to the big show. Koko’s ELC has expired and he is expected to either be traded to another organization or pursue his Europe options with St. Petersburg, which owns his KHL rights. Sean Kuraly, C (trade with SJS- 2015): The Miami University RedHawks captain signed for two years (thru 2018 at a $809k cap rate) after finishing a disappointing senior year. Acquired from the San Jose Sharks last June as part of the return for goaltender Martin Jones, Kuraly has good size and skating ability to be more of a two-way center or wing who is heavy on the puck and does the grinding work on the bottom-six. Zane McIntyre, G (2010 draft, 6th round): A TSP favorite since before he was drafted in 2010, it was a season of ups and downs for the rookie pro. The former star at University of North Dakota has some work to do on technique and mechanics after being exposed at times during the regular season. His performance in Game 3 was a particular disappointment, but he has the drive to roll up the sleeves and get to work, so it will be interesting to see how he responds to the adversity next year. He’s signed through 2017 at a $975k cap hit (RFA). Colin Miller, D (trade with LAK- 2015): The NHL tools are clearly there for the one-time Kings prospect picked up last draft day as part of the Milan Lucic trade. Although not tall, Miller has a thick build and has the skating and puck skills to be a solid NHL defender, but he also has to show he can think the game enough to log bigger minutes and take care of his own end. Miller’s ELC ($602,500) expired and he is RFA. Expect the B’s to extend him a qualifying offer and we’ll see what happens next. Rob O’Gara, D (2011 draft, 5th round): Four-year starter and NCAA champion at Yale University finished up his eligibility this past March and signed a two-year ELC worth $925,00 per through 2018.A big (6-4), mobile defender who is sound positionally and can move the puck effectively, O’Gara may need developmental time in the AHL, but could one day join Boston’s blue line to form a pretty good shutdown presence with Carlo. Malcolm Subban, G (2012 draft, 1st round): After a rough beginning due to a lower body injury, Subban was playing the best hockey of his pro career over a two-month stretch in the AHL when he took a shot to the throat in warmups. A fractured larynx cost Subban the rest of his season and means he has to hit the reset button, so to speak. He’s talented enough to win the Boston backup job this fall, but experience and an extended run as an AHL starter have continued to elude the 24th overall pick. His ELC runs for one more season at about $863k before he becomes RFA. Frank Vatrano, LW (undrafted free agent- 2015): The crown jewel of undrafted free agents last year tore apart the AHL (36 goals, 55 points) in 36 games with Providence, and still found time to make an impressive showing in Boston, where he finished the NHL season. The Springfield Rifle (no, I’m not calling him the “East Longmeadow Rifle”- that doesn’t have anywhere near the ring) added eight more goals in 39 games while exhibiting the speed and gusto that is sure to produce more offense at the highest level. Vatrano’s transformation and sheer impact this season earned him AHL co-Rookie of the Year honors (with Colorado prospect Mikko Rantanen) and set him up as a potential key contributor in Boston going forward. Daniel Vladar, G (2015 draft, 3rd round): After finishing a solid USHL season with the Chicago Steel, the 75th selection last June is a giant (6-foot-6) project with impressive athletic ability. On the flip side, Vladar needs work with his technique and is still pretty raw- it remains to be seen whether he will be in the AHL, ECHL or possibly Europe next season. While not impossible, NHL is about as long a shot as it gets for Vladar at this stage of his development. Signed a three-year contract in late April worth $742,500 annually. After a few days of hiatus (and a solid B’s home win Saturday afternoon against the New York Islanders) TSP is back with another update on the Boston prospects. This post’s focus area is on the upstart Providence Bruins, who are a solid third place in the AHL’s Atlantic Division with a 30-19-9-3 record. What could have been a devastating loss when Malcolm Subban was hit with a puck during warmups nearly two months ago was mitigated by depth- Jeremy Smith and Zane McIntyre have ably filled in since then. The Springfield Rifle- Frank Vatrano– (profiled earlier in the series) has done much of the heavy lifting offensively, with a remarkable 31 goals in 31 AHL games this season, his first as a professional after signing with Boston out of UMass a year ago. The AHL’s No. 2 scorer behind former Bruin Chris Bourque (but Griffith’s 63 points in 48 games have happened in 11 fewer contests than Bourque’s 66 points) has continued to roll in the Providence offense as he has done since starting the 2015-16 hockey season a little late due to a lower-body injury suffered in a preseason game with Boston. The former London Knights star and fifth-round pick in 2012 (acquired from Tampa Bay for Benoit Pouliot) has proven himself to be a dangerous scoring option at the AHL level but is still looking to carve a niche for himself in Boston. Griffith has outstanding hockey sense and silky-smooth hands, which has allowed him to produce at every level to date, and he even invigorated the offense-starved B’s a season ago when he was called up and like Frank Vatrano flashed promising scoring chops before cooling off and being returned to the AHL (he scored 12 goals and 31 points in 39 AHL games in ’14-15). Although Griffith lacks the pure speed and extra gear to separate in the open ice, he compensates with the natural instincts and feel for the flow of the game. He’s able to quickly dart into spaces in the offensive zone and use his excellent puck skills and lightning release to get pucks to the net and find teammates in scoring position. At just 5-foot-9 and 190 pounds, Griffith doesn’t have the size and ideal explosive element to his offensive repertoire but is smart and finds ways to make plays when the puck is on his stick. He must continue to develop and refine his game away from the puck, however. He’s smart enough to understand positioning and his responsibilities within Boston’s possession system, but without the size and strength to fight through defenders, he often times must outwit bigger, stronger opponents in puck battles along the walls. He does use his lacrosse background to good effect in terms of how he slips through seams in traffic and bounces off of would-be checkers to establish position in front of the net. Current assessment: The dreaded “‘tweener” tag is still hanging around Griffith, but if the Bruins could figure out a way to get him into the mix for more of an extended look, it might prevent a mistake of letting him go only to see him blossom into a top-six NHL forward in another team’s colors. It’s high time to determine the way ahead for Griffith and the clock could be running out given out the situation at forward and the other options that GM Don Sweeney must choose from. Having said that- he’s a top scorer in the AHL and we’ve seen him demonstrate a real killer instinct around the net. If there isn’t a future in Boston, here’s hoping the Boston brain trust can figure out how to properly leverage Griffith for the kind of return the team can build around. This polarizing figure among the Boston fanbase is the organization’s biggest enigma. In Providence, he’s producing at a 1.13 points-per-game clip (18-33-51 in 45 gp), playing in all situations and proving himself as an exuberant player who finds ways to make a difference. Contrast that version of “Koko” with the guy who comes up to Boston and has a hard time contributing and making an impact at the NHL level. To simply point at linemates and ice time, thereby blaming the Boston coaches as the root cause of his lack of success is a lazy argument that does not take into account that with his natural talent and ability, even the limited action does not square with the wholly lackluster impressions he’s made in the NHL. Greater opportunities are earned, not given- just ask Noel Acciari. Koko is a player who on talent and skill alone should have enjoyed more big league success by now, but that production and impact has eluded him. It’s possible that he has put much pressure on himself during his various stints in Boston and that self-imposed stress accounts for his inability to demonstrate any kind of real effect. It is also possible, that he has been unable to take the coaching he’s been given and translate into his on-ice play in the NHL to date. Whatever it is- there is such a dichotomy between the Koko we see scoring big goals and making brilliant passes in the AHL- it’s hard to project what he is right now. In similar fashion to Griffith, Khokhlachev doesn’t have the size and speed that NHL teams embrace, but he’s got enough ability with the puck that he has developed into one of the more consistent scoring threats at the AHL level. He’s creative and can push the offensive pace when on top of his game. He will go stretches where he is ineffective, but he can just as easily blow a game open with a shifty move at the blue line or a nifty slip of a check inside the zone to fool the goalie with his blurry-quick shot or find a linemate for a layup. Current assessment: As is the case with Griffith, the Bruins will soon find themselves making a decision on Koko. In fairness to the kid, he just wants to be able to show what he has at the NHL level, but it isn’t like Boston has buried him, either. It’s not a simple matter of just taking the most skilled players and plugging them any old place on the roster- there is still a need for grit, hustle, determination and effort. Khokhlachev’s lack of a consistent game away from the puck is what has held him from earlier NHL opportunities when his offense was more of a need. Now, with the majority of the forwards finding ways to contribute, there isn’t much for a player of his style and position to do other than to keep producing in Providence and be ready should the team determine he’s worthy of another chance and summon him once more up I-95. If the Bruins could somehow tap into the AHL version of Koko and see that level of energy and…here’s the key now…production- then things might be different. As it stands, he’ll likely be moving on and one can only hope that if he does the team won’t rue the day he didn’t get more of a look in Boston. There’s certainly a segment of fans out there who won’t let them forget it. It’s been a tough year for the 2011 fourth-rounder who parlayed a solid rookie pro season in ’14-15 into a spring cup of coffee with the Bruins, where he did not look at all out of place on Boston’s fourth line. Unfortunately, a concussion suffered in the 2015 AHL playoffs bled into this season, as he played one game at the beginning of the 2015-16 AHL campaign before being lost for much of the schedule. With just eight games played total (three goals), Ferlin is still getting his timing and all-around play down, though he’s putting in the effort to be the heavy player his Providence coach Bruce Cassidy went out of his way to praise last season. He even got into a fight (though some will cringe at what that does for a guy coming back from post-concussion syndrome as Ferlin has endured) yesterday in Providence’s loss to Utica. A big-bodied power forward at 6-2 and about 215 pounds, Ferlin is a straight-ahead player who has surprising agility and a deft touch with the puck as an underrated passer from the right side. He’s not overly creative or dynamic- more of a stick-on-the-ice and drive the net kind of winger. A superb athlete- his father played NCAA baseball- Ferlin grew up in the Sunshine State and left home to play in the USHL for the Indiana Ice (with fellow B’s prospect Sean Kuraly) before spending three seasons with the Cornell Big Red. A ’92-born player who was passed over in his first year of eligibility, Ferlin has worked hard to improve his all-around play and understanding of the game after being a player who was often counted on to just go out and score in minor hockey. Current assessment: The concussion setback may have prevented Ferlin from seeing some NHL games this season, as the fourth line in Boston has been a bit of a revolving door all season. Right now, the priority is getting him back into game shape and making sure he’s able to continue to play effectively without suffering any after effects of his extended layoff. That might mean he doesn’t get a chance to see NHL action this season, but in the longer run that may pay off for Boston. In any case- he’s not a high-end scoring type, but showed effectiveness as a heavy on the puck/possession style forward who is able to cycle the play down low and establish a net-front presence. If he can develop his shot and goal-scoring touch, he could eventually challenge for third-line duty somewhere. The Michigan native and former Miami University Redhawks captain might be just 5-9 and maybe 170 pounds soaking wet, but man- can he ever motor! In retrospect, no one who saw the right-shooting center in the NCAA should be surprised at the fact that the AHL rookie has produced at nearly a point-per-game pace with 15 goals and 46 points in 53 games this season. He skates up the ice at a blistering pace, revving a never-stop motor into the red with his fast feet and eternal energy source from within. When you talk about small players needing to be dynamic, Czarnik fits that prototype. He explodes to top speed in just a couple of rapid, slashing strides and is also able to jitterbug through open space, daring bigger defenders to stay with him. When the puck is on Czarnik’s stick, it’s almost like an extension of his own arm- he can handle it at top speed and takes it in and out of traffic with the effortless balance and grace of motion. He’s not a prolific goal scorer, but he knows how to finish plays off around the net and isn’t afraid to shoot pucks when the lanes are there. A superb passer who can make on-target feeds from both sides of his stick blade, Czarnik makes those around him better. Alas, with his size- he’s got to be a consistently special player in order to find success at the highest level. His work ethic and hockey IQ will go a long way towards helping him get there. Czarnik does not have the strength to assert himself in the o-zone, but he is willing to go into the dirty areas and pay the physical price to make a play. Current assessment: Boston’s cup runneth over…at least right now when it comes to the center position. Patrice Bergeron, David Krejci and Ryan Spooner are pretty entrenched up the middle as things stand right now, and Acciari has certainly made a convincing case to remain in Boston for now as a stabilizing force on the fourth line (just look at the ice time and special teams work Claude Julien has already given him), so it is difficult to project where and when Czarnik will fit in up in Boston. Given that he’s made a career out of proving the doubters wrong, I wouldn’t count against him. He may be small, but he’s fast and simply dynamic…the NHL has room for players like Czarnik in the right role and given time to develop his all-around game, which was already pretty strong coming into the pro ranks. The Boston Bruins announced their latest round of roster transactions on Thursday here. To the surprise of very few, three young promising forwards were included in a group of more seasoned minor leaguers. Alex Khokhlachev, who is entering his third full AHL campaign after finishing the end of the 2012-13 season in Providence after splitting the year between the KHL in his native Russia and the Windsor Spitfires of the OHL, was unsuccessful in earning a spot with the team, at least for now, as we are a week away from the start of the 2015-16 regular season. Koko is a talented center who played with some hustle, but his inability to get on the score sheet resulted in his having to go down. The NHL isn’t a video game in which you take the players that have the highest number rating next to their names and load them up on four lines and away you go. While skill is very important, what also comes into play is how effective a player is in the role the team expects him to play. Fans can sit on message boards all day long and talk about how they *feel* or *think* a player like Koko on the B’s fourth line makes more sense than veterans such as Max Talbot and Chris Kelly, but that is irrelevant. What matters is what the Bruins coaches and management *know* and that is- Koko is not ready for a full-time contribution in Boston. They make the decisions- right or wrong- and it wasn’t hard to see that Koko’s struggles to generate offense no matter his linemates or ice time in the preseason made it a relatively easy choice for Don Sweeney and Claude Julien to make. Koko’s time in Boston/the NHL will come. Or it won’t. People will disagree with management’s decision on this one. Or they won’t. But it’s pretty apparent that the 22-year-old just didn’t build enough of a case for himself to generate a robust debate. Don’t be so sure that the B’s will trade him right off the bat, though. They were reminded of an important lesson last year with the handling of Ryan Spooner, and it usually doesn’t make sense to sell low, which is where Koko’s value is right now. Anton Blidh was on the bubble and close, but again- with no shortage of gritty wingers on the Boston roster, it was a tough sell to expect him to stay up with the club as a spare part at this stage of his development when he could play a lot of quality minutes in the AHL. He’ll be back. It was much of the same thing for Brian Ferlin– he scored a nice goal in Detroit last weekend, and showed flashes of his ability to chip in on offense, but he’s also young and still learning the game. As was the case last year, he’s on the short list of callups to Boston if players get hurt or underperform. Still on the team- Tyler Randell. And good on him. The former Belleville Bull and Kitchener Ranger has never made it this far in an NHL camp with Boston and is making a case to stick, or at the very least, make the roster as the extra forward. The hard-nosed winger is legit tough- he won’t bring much offense to the table, but he at least has NHL-caliber hands so as not to be a total liability. The B’s would have to put him on waivers to send him down to Providence and there’s a good chance a team without as many lower-line depth forwards as Boston has right now would pluck him away much like what happened with Nate Thompson back in 2008. We’ll see if he can force the team to keep for now, but this has been a solid showing by Randell, who scored a goal in a win over the Rangers last week and fought gargantuan D Dylan McIlrath so that much smaller Zac Rinaldo wouldn’t have to. Tommy Cross was waived and will likely pass through and report to Providence. He’s a top person and solid minor league defenseman. He impressed a lot of people with his camp effort- the former 2007 second-rounder is a good skater with a hard point shot and is one of the top character types around. Based on what I saw, if the Boston defense depth chart takes a hit this season, I could see Cross being given an opportunity at some point. He’s earned it.